A development application has been submitted for a new 81 storey residential tower known as No.1 Brisbane. 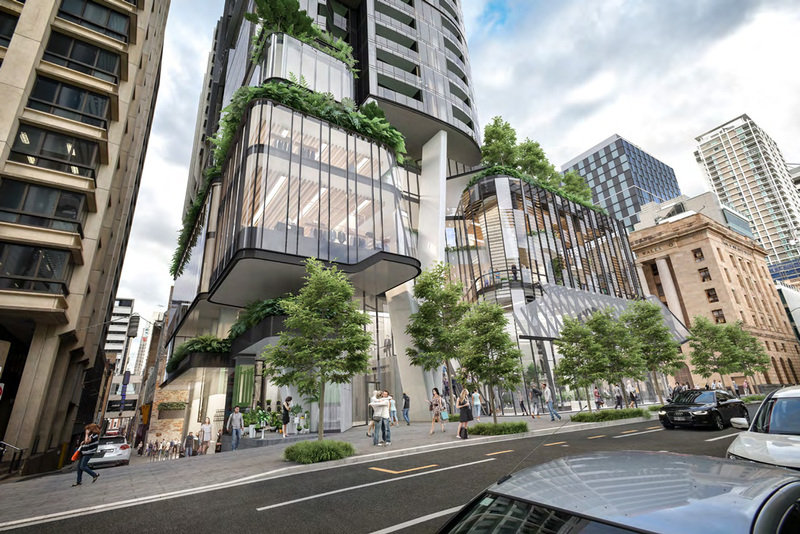 Located on the corner of George & Queen Street, the proposal represents the first Australian residential apartment building to be situated directly on a CBD shopping strip and would feature views over the Treasury Building towards the future Queen’s Wharf IRD. Designed by Blight Rayner Architecture, the applicant behind this proposal is 151 Property Core Plus Management Limited on behalf of The Trust Company Limited who are the owners of the current commercial buildings on site at 231 George Street and 52 Queen Street. According to the development application, the building aims to be a ‘breathable’ green ‘vertical city’ of self contained communities. No.1 Brisbane is another tower that scrapes Brisbane’s artificial maximum height limit of 274.3m AHD. An ongoing CASA restriction due to a Brisbane Airport radar location issue means that new residential towers in Brisbane’s CBD can only be built up to this height. The podium is designed as a fully active street building with a series of connected retail spaces. The proposed plan allows the public to move not only across the site but also up through the site via a series of voids and escalations culminating at the landscaped podium top. The proposed scale aligns with the adjoining heritage building to continue the Queen Street scale. 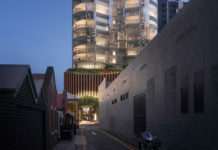 A light filled laneway connecting Burnett Lane to Queen Street will reveal the neighbouring heritage building’s corner and side boundary historic brick wall. All podium levels will comprise of retail, food and beverage uses to activate the edge and increase the depth of Queen Street Mall. The podium design provides for increased connectivity, permeability and activation of Burnett Lane, through the provision of the public laneway arcade through the site connecting Queen Street Mall and Burnett Lane as well as the continuation of uses unique to a laneway setting including boutique urban cafes, bars and galleries. The podium also intends to incorporate a number of public outdoor, recreational spaces, including the prominent ‘Great Verandah’ that visually connects the proposed podium with the surrounding public realm, including the Queen Street Mall, Reddacliff Place and South Bank. Proposed recreation space is located throughout the tower in order to maximise accessibility to all residents. The recreational spaces will provide communal facilities including BBQ areas, Function and Media Rooms, Gym facilities and Pool areas to further facilitate the concept of a Vertical City, comprising an overall floor area of 4,470m2. The DA number for this development is A004673366. Fun fact: Around 50% of tenants in residential apartments in inner Brisbane (who are renting a unit with a car space) do not actually own a car, yet it is a council requirement to have 1 car for every 2 bedroom apartment dwelling - which puts a massive strain on already congested roads, discourages PT and invites more cars into the city. This is the first residential apartment tower in Brisbane to have far less car parks then required (which is a great thing for Brisbane to become less car-centric). With 390 spaces in total, the building has 187 less spaces then allowable under Brisbane City Council's antiquated Transport, Access, Parking and Servicing Planning Scheme Policy of 587 which hasn't been updated since Brisbane City Plan of 2000. Due to the site's sensitive location around very high pedestrian traffic, lower car parking requirements at this development site would generally be accepted. Location and public transport is excellent, the only way it could be improved would be if there was a direct underground portal to a rail or high frequency transit line within the development. However the close proximity to the future Brisbane Metro and KGS/Queen Street Bus Stations is excellent. Street activation and design is also excellent, while the building's proposal to achieve a 6 star green star rating is commendable. Another nsil into the coffin of creating inner city into vallies of shadows. Has a impact study been done on shadows it will cast. The idea of the Queen St Shopping mall is to create open spaces of fresh air and sunlight. Seems that natural sunlight will be replaced by shadows. Traffic conjestion during construction in that area is already bad enough without adding to it. Unbelievable Tallingly beautiful building!! Bring on Brisbane watch out Sydney and Melbourne!! Brisbane N. 1 City of Australia!! Myer Centre just needs to go. That place is tired, tired, tired. I would expect a development-oriented web site like this to use well-establish tall building terminology more precisely – specifically “supertall” is a term reserved for buildings over 300 m, but less than 600 m. Beyond that the term “megatall” is used (see CTBUH website). This is clearly a tall building, but not a “supertall” one. The “fun fact” rant on parking spaces explains to me why we have such horrendous parking problems in the city-proximate suburbs of Brisbane. Like many, I use public transport to get to work, but I still have a car for weekend or evening use. Units without allocated carparks just cause frustration with on street parking (explore the ill-planned disasters that are Teneriffe or Newstead). That “fun fact” is a short sighted ideological philosophy that only brings a smile to the developers face. Adequate parking is essential to the urban residential projects. I would have to agree with you that adequate resident parking is vital to avoid parking issues in inner city areas, hence why the “antiquated” policy is in place. A lot of work needs to be done for Brisbane to become less car centric, most notably making public transport more convenient, reliable, accessible and cost effective, not removing parking from residences who need it. Wow. 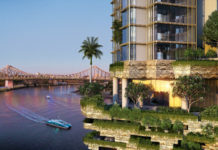 Another unit building for subtropical brisbane, that, apart from some facade planting, appears to provide little subtropical design for the units themselves. The south and west facing units will be airconditioned (or heated) glazed boxes barely liveable on a summer’s afternoon, and rec areas aren’t well located on the west with pools on the south/south-east. What happened to opening windows and big balconies? There seems to be a trend for these awning windows that don’t give good genuine openings and look like they’ll just funnel hot rising city air into the units. Yep – this just clearly came across as an excuse to save costs./increase profit. I’m all for Tall/Supertall residential, but do it properly. I would specifically avoid any development without adequate parking as a buyer or resident. Brisbane is a new world city, or so they say. This design is absolutely not new world. Really! Firstly, people comment about shadow and traffic. Yes traffic will get worse for a bit, it is temporarily. That is 101 for every new site if you want to improve. Shadows will be there. We are in an age of going higher and we need to. Reality, Brisbane is the 3rd largest city in the world by area! That is ridiculous. Deforestation and and and. It is unacceptable. We need to go higher. But please do it in style. And this is not it! If Brisbane is new world, be a statement. Stand out and be an example of what can be and what is possible. Be the new world and go the extra. But please don’t stand out like a sore tooth as this.